Believe it or not, the news from Dearborn, is a huge Ford Mustang Sales Increase even with a new 2011 Mustang waiting on the burner for 2010 and 2011. Ford's last year's sales for the iconic pony car increased 57% from the previous year. While a good performing Mustang has always been part of the pony car's success, quality is becoming a big part of the success story. To give you an idea of how well Ford is doing in improving quality, Ford's warranty repair rates have decreased globally by 40%. This strong focus on improvements in quality are evident all around. 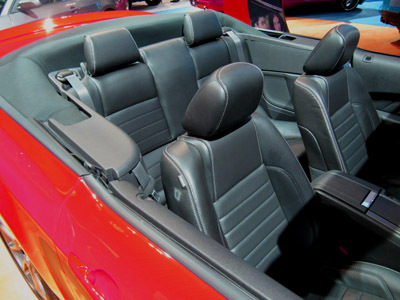 In particular, you'll see major changes in the interior of the 2010 or 2011 Mustang. One look inside and the fit and finish upgrades are evident. The seats caught my attention first. Very nice looking leather. Good even stitching. Better materials inside wherever you look. What I really was looking for was the new soft feel dash material. I was hoping for a major improvement in the look and feel compared to the original new Mustang from 2005. It really is dramatic. Visually, my first impression was, the difference between a cheap rental car and a high end luxury car. With all the changes to the 2011 Mustang and it's already impressive initial sales numbers, you can only imagine the sales increases for 2011. Nice to see a domestic manufacturer doing things right.